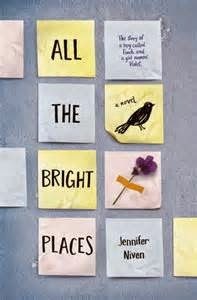 All the Bright Places, by Jennifer Niven (Knopf Books for Young Readers, January 2015), isn't the sort of book I usually post about, or even read--it's not speculative fiction, it's not middle grade....instead, it's a poignant YA book about sadness and mental illness. And their lives entwine. Together they explore the wild and wacky corners of Indiana, and learn each other, falling in love. But Finch, though he does the best he can, is drowning in the swirling extremes of his own mind, and oh goodness, as I read, I was more and more anxious to be reassured that he would be saved for real, by himself or by Violet, but. So it is dark, and sad. But yet the experiences Violet and Finch share, and their relationship, are beautiful, and memorable, and heart-warming. It's one of the more memorable and heart-touching stories of mental illness I've read...possible because Finch seems so help-able, so worth helping, and Violet is so much more than side-kick supporter. 1. Make sure I am a better, more aware mother than Finch's is (this is not hard). 4. Read Virginia Wolff's The Waves, from which Finch and Violet quote (with the help of some quick google searching, which made it much more believable). Here's the Kirkus review (starred). I am seeing this around. I guess I should check it out! I am boycotting this one. "Interspersed with suicide methods"? Just what we should be handing students. Even Shusterman has a book out on "mental illness", so this must be the trend. I'm fed up with it. And it doesn't matter how aware you are as a mother. Life happens. Ah gee. But this mother is really a failure. Agreed about the whole makes me want to go to Indiana bit. (And agreed to the map part!) It was the best part of the book for me.